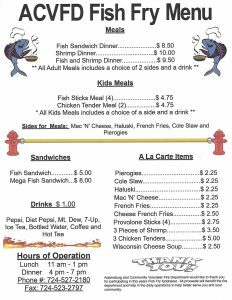 Annual Fish Fry Starting February 14th!!! 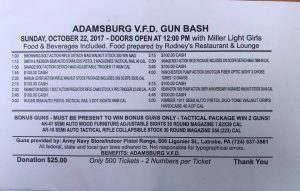 Adamsburg and High Park Volunteer Fire Department will be holding the Annual Fish Fry. Which will start on Ash Wednesday, February 14th at Adamsburg VFD. We appreciate your continued support for these events!! Rescue, Service 10 and Vent 500 from our combined response plan responded this morning along with the first alarm for the Working Commercial Structure Fire on Garden St. in Hempfield Township. Units provided the Rapid Intervention Team with Rescue 34 (Crabtree) and Ventilation. The Adamsburg and Community Volunteer Fire Department would like to invite local families to come and have breakfast with Santa!! Santa will be making a stop at the ACVFD at 9:00 am on December 23rd. There will be breakfast, cookies and treats handed out by Santa and his helpers. Fall Gun Bash tickets are in! It will be held Sunday, October 22, 2017, doors open at 12:00pm. Tickets are $25.00 and will be available at the L&L Fleatique, and Pitt Industrial Diamond Products/Pitt Rental Center. In the last week, Adamsburg and High Park VFD received word that Firefighters K. Anthony, C. Kuchar, M. Lupinacci, and Captain Stikkel have obtained their Pro-Board Firefighter 1. We would like to congratulate these firefighters on this milestone in their career as a firefighter. These firefighters join Chief Thoma, Asst. Chief Thoma, Capt. Kuchar, Firefighters, A. Thoma, M. Shabe, T. Connors, C. Brockhoff and B. Bouldin in having a minimum level of Pro-Board certification. This is a great example of how the combined company is looking to better ourselves as firefighters for our community. We currently have a few other firefighters in the process and in the future High Park and Adamsburg hope to grow the number of firefighters who have this type of certification as much as we can.